European Peer Lending: Has it Gone Mainstream or the Opportunity is Still there? Earlier this year the Centre for Alternative Finance at Cambridge Judge Business School, in co-operation with professional services firm E&Y, released a pan-European study of the alternative finance market. The study, titled “Moving Mainstream”, can be considered the most comprehensive study on the subject released to date. The researchers studied the peer-to-peer consumer lending sector (a subset of the alternative finance market) and reported an impressive growth of 272% between 2012 and 20141. The study estimated that the P2P consumer lending market in the UK reached a volume of EUR 752m in 2014, with peer lenders in other European countries contributing another EUR 274.62m1. The triple-digit growth and transaction volume of over EUR 1 billion sound impressive. However, to validate if peer-to-peer lending has “moved mainstream” (as the title of the study suggests), we need to compare the peer lending volumes with the addressable market size. 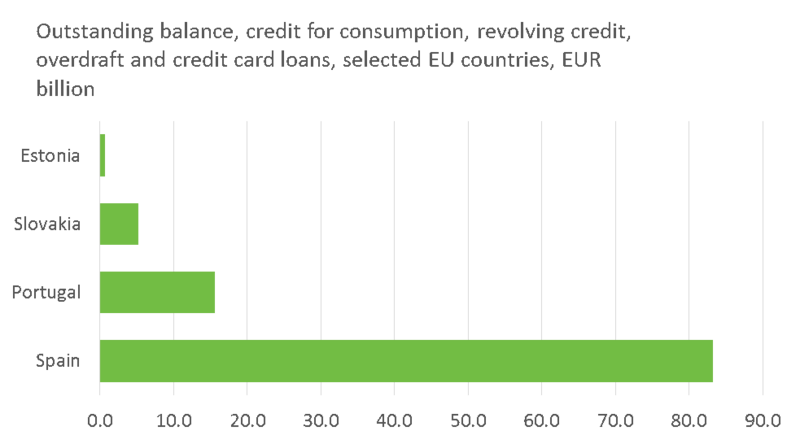 According to the European Central Bank, the outstanding balance of consumer credit, revolving loans, overdraft and credit card loans in European Union countries reached EUR 1.04 trillion2 by the end of 2014. Comparing peer lending volumes with personal loans and credit card overdrafts makes sense, as those are the key areas that peer lenders are attacking. As the data highlights, the total consumer peer lending volume in 2014 (or the estimated EUR 1 billion of issued loans) represents less than 0.1% of the opportunities that peer lenders are pursuing. Even when compared only to the convenience and extended credit card loans – the smallest segment in our comparison dataset – peer lending volumes constitute just over 2% of the market! The study continues by highlighting several markets that stand out on the European landscape. In particular, it highlights the United Kingdom, which is considered to be the most advanced peer lending market in Europe. According to the European Central Bank, the outstanding balance of consumer credit in the United Kingdom at the end of 2014 exceeded EUR 150 billion2. Thus, the combined volume of consumer peer lending in the UK amounts to 0.5% of the market. It is a marginal contribution, which can hardly be called mainstream just yet; however, the growth pattern is impressive. Consumer peer lending volume represented just 0.12% in 2012. 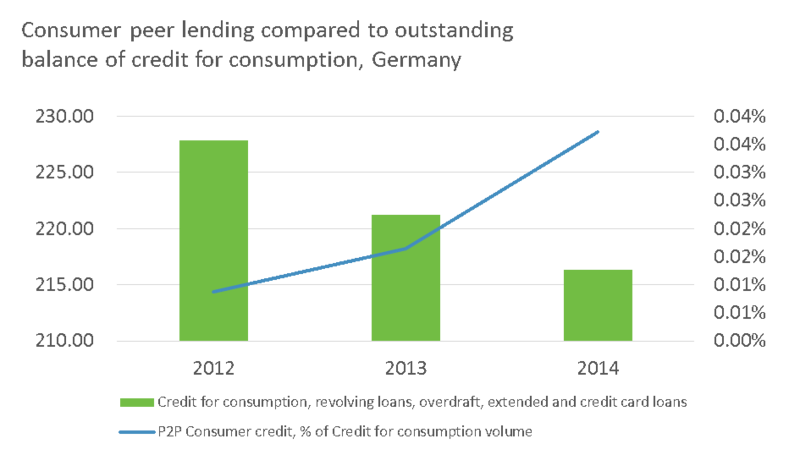 Similar analysis of Germany reveals a total market potential – estimated using the outstanding balance of consumer credit, revolving credit, overdraft and credit card loans – of EUR 216 billion2, and the consumer peer lending volume of EUR 80.4 (in 2014) representing only 0.037% of it. If German peer lenders could catch up with their UK peers in terms of the relative volume to the market potential ratio, it would represent EUR 1.08 billion in annual volume rather than a mere EUR 80.4 million. 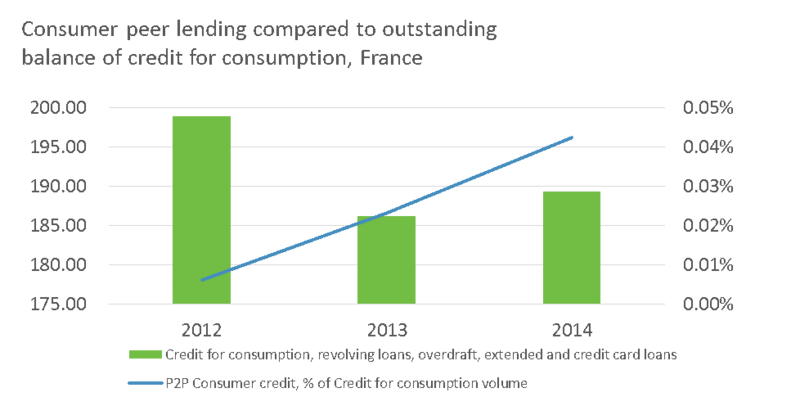 A comparable situation and potential for consumer peer lending growth can be observed in France. The country exhibits a market potential of EUR 189 billion2 – estimated using the outstanding balance of consumer credit, revolving credit, overdraft and credit card loans – and the consumer per lending volume of EUR 80 million amounts to just 0.042% of it. 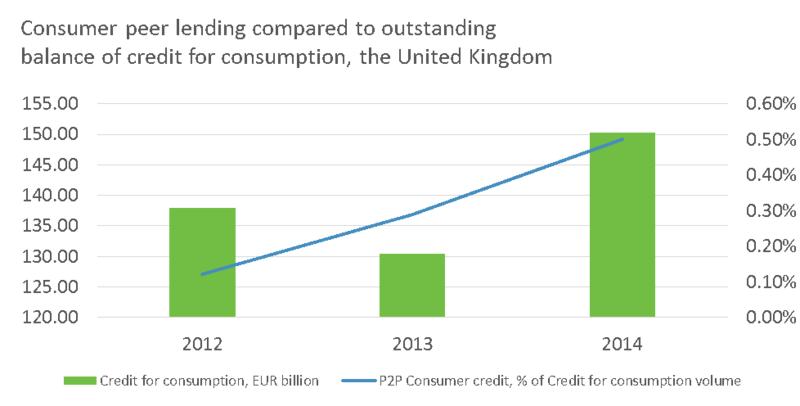 In the case of France, catching up with their UK peers would drive the volume of consumer peer lending to EUR 947 billion annually. The drastic differences in the peer lending landscapes between the United Kingdom, Germany and France can be found in a) the regulatory environment and b) the competitiveness level of traditional lenders. For instance, while UK regulators are considered to be open to peer lenders, the Cambridge University study reveals that 58% of the surveyed peer lenders in Germany responded that the regulation is excessive and too strict, while only 13% of the surveyed players stated that the regulation is adequate. Operating as a peer lender in Germany can be harder from the regulatory perspective, which might be hindering the growth of the sector. 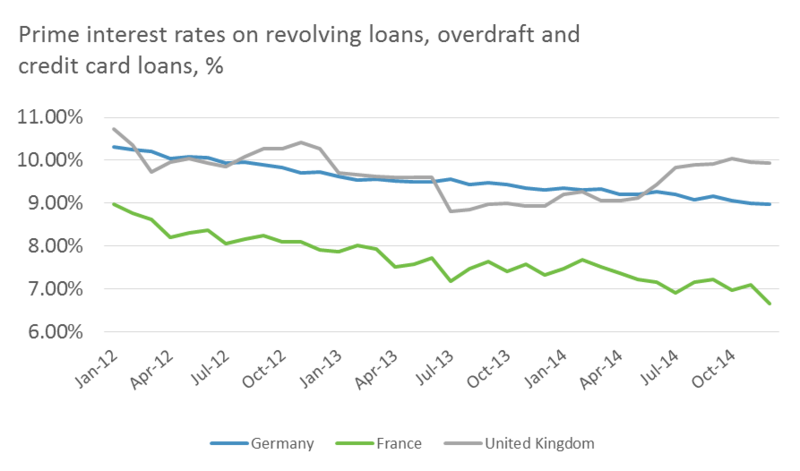 However, the prime interest rates for revolving loans, overdraft and credit card loans in Germany are similar to the interest rates in the United Kingdom3. The similarity in the interest rates suggests that German peer lenders should be able to compete with traditional lenders and achieve the same level of success, at least in the credit card refinancing segment (which stood at EUR 259 billion by the end of 2014). 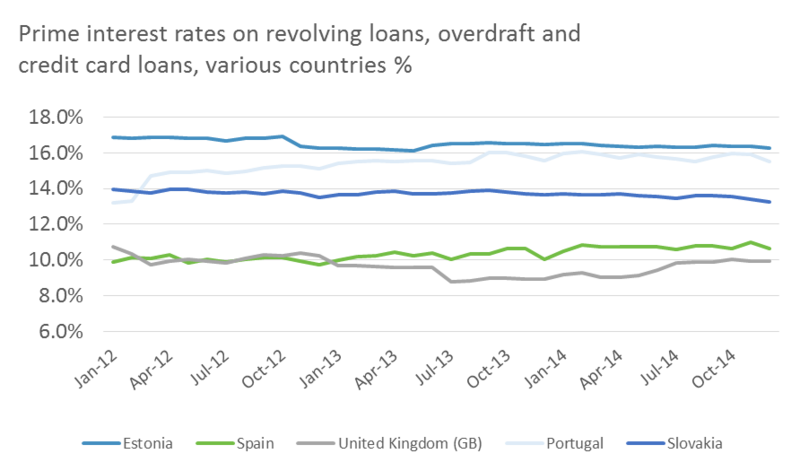 Analysis of the peer lending potential from the perspective of competitive interest rates offered by traditional lenders hints at high potential in EU countries like Spain, Portugal, Slovakia and Estonia3. As the chart below suggests, the average interest rates in those countries, as reported by the European Central Bank, are considerably higher that in the United Kingdom. And although the economies of Spain, Portugal, Slovakia and Estonia are smaller than that of the UK, Germany or France, those markets still have outstanding balances of consumer credit, revolving credit, overdrafts and credit card loans of approximately EUR 105 billion2 (and with the exception of Estonia have very limited presence of peer lenders). The above, although not attempting to be a complete analysis, highlights just how massive the opportunity is for peer lending in Europe and that there is still a long road to travel before peer lending becomes mainstream. Even in the UK – the largest peer lending market in Europe – the volumes are still marginal compared to the traditional lenders, and the gap in other European economies represent even greater opportunities. If you are attending LendIt New York conference, don’t miss our CEO and co-founder, Partel Tomberg, joining the panel discussion “The European Online Lending Opportunity”. The panel discussion is taking place at 2PM Eastern Time on April 14.